Ansonia Clock Co. "Novelty No. 579", ca 1914. 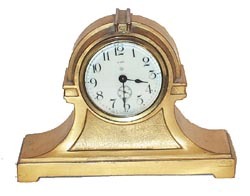 Gold plated metal case is 6 inches high, 3 inch porcelain dial with seconds dial, signed by Ansonia. 8 day, backwind movement is running. This is one of a large number of metal novelties made by Ansonia. Ly-Ansonia No. 2324.